Is Art a Spiritual Pursuit? A decade later, some of his young fans, now grown up, decided to figure out the mystery of Rodrigues. That’s what the movie is about, and while they do find him–alive–toiling at minimum wage jobs in Detroit, it doesn’t explain the man. Perpetually hiding his eyes behind large shades, tall, skinny and monosyllabic yet mellow and utterly without ego, Rodrigues seems to live in an alternate universe. He is not quite of this world, and that seems to be the reason why he can sing about it with such insight and honesty. His first name is Sixto but also Jesus, and like Him, he gives away most of the money he makes when he finally sings at sold out concerts in South Africa. He continues to live in a ramshackle place in Detroit, and is as unknown there as everywhere else in North America. Questions about his ‘creative drive’ or his fame are shrugged off; he is who he always was: a modern day poet who prefers to live with what another great poet, Keats, once called ‘negative capability’. That is the ability to embrace uncertainty, ambiguity, and pain. And turn that into art. In an age of relentless scientism, materialism and reductive positivism, this stance is not only rare, it is actively discouraged. Just look at what they are doing to our hapless youth. If you haven’t figured out what you want to be by age 16, Counsellors begin to worry about you. And wanting to be an artist is not considered a career option in spite of all the cant about how much we need and want ‘creativity’. Yeah, we want it as long as it doesn’t upset the status quo, and drives the economy. The only art we recognize is the one that gets a seal of approval from critics, curators and other taste makers of culture. Alas, art is all about making money, and since artists have to eat, who can blame them for becoming marketers and promoters, knowing full well that art and commerce are natural enemies and that the price of art has no relationship to quality. Maybe art should be banned. It seems that when it’s forced underground, people start to appreciate it. I’m only half kidding. Sometimes, a miracle happens: Rodrigues is that miracle; an artist who spoke directly to an entire generation of young people who had no idea who he was: they just drank in his words and his music because it gave them permission to seek what is most precious in life: liberty. Without any of the usual trappings of marketing, shows, managers and critics, Rodrigues was a powerful force through his music and his words. He is a deeply spiritual man, and even after his triumphant embrace of his fans, he remained what he is: a spiritual force in a materialistic world. 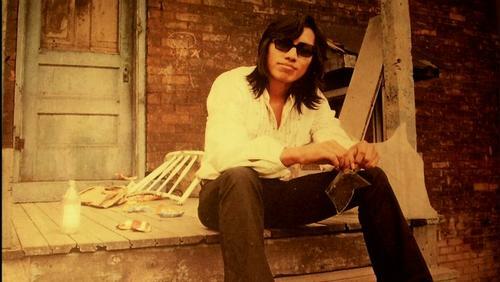 Searching for Sugarman is a wonderful documentary, a movie about something we have almost forgotten: that art speaks directly to people about our highest human aspirations. And when it’s done right, it doesn’t need promoters to get its message across. All you have to do is listen, look, and engage in something that takes you to a place that is not exactly like this one, but shows you what it really is. My old friend Marshall, unheralded sculptor, friend of Henry Moore, quiet genius, would approve of Rodrigues and recognize a kindred spirit. And he would be just a tad envious. Rodrigues achieved something Marshall dreamed about all his life: a direct connection to average people. Like Rodrigues, Marshall was not driven by ego, or the need for fame; he had something to say to the world and he said it in sculptures of classic harmony and carefully resolved proportions. He was hoping that the people in Vancouver, where he lived all his life, would one day, appreciate his forms, so meticulously finished over many months. When that failed to happen, he became morose. At the end of his life, he was deeply discouraged, not because fame had eluded him; no, because he had not been able to find a larger, appreciative audience outside the coterie of admirers he attracted. He wanted to be understood on the level that Rodrigues was, to be part of people’s lives. He wanted to touch them spiritually. Marshall never found his South Africa, and to this day, his work is largely unknown to a wider Vancouver public. Although a bequest of his three classic marble figures to the Van Dusen Gardens might change that. These three ten foot high Carrera marble pieces are placed at the entrance of the garden, where they will be seen by everyone coming into the park. Let’s hope that this is the beginning of the connection to the people that Marshall, and indeed all artists, crave. Wonderful text. But art is not a purely spiritual pursuit, for were it so, atheist artists could not exist. But they do. And some of them do manage to get their share of decent income, staying within their materialistic paradigma. It’s not all black and white, I am afraid. Even St.Francis of Assisi recognised that all too well when he created his Third Order of commoners 😉 Thank you! Well… I have to plead my ignorance of both Rodrigues and Marshall and now need to do some studying, so I should thank you for that. On art as spiritual growth, a resounding yes. In my experience, the process of painting is meditation itself, especially when things get very detailed. The more difficult and tedious the process becomes, the better I like the experience. As one who over the course of 5 decades scoffed at all religiosity, I am now constantly and deeply involved in studying spiritual matters as they present themselves not only in my own mind, but in the writings of like-minded people from around the world. Perhaps it’s normal for someone in their late 60’s to start thinking on these topics, but I don’t see many others my age so captivated by the long history of belief in spiritual realms. I can only assume it was the meditative states achieved during the careful applications of paint. Looking over the complete body of work I’ve done so far, I can see the transition toward related themes plainly.